Yahoo! have the best security of the big three. When was the last time you heard of a Yahoo! security issue? There's an alert on Flickr right now. It's a simple phishing scam. It's worth Flickr taking this extra effort because so many of Flickr's users aren't web savvy. They don't need to be web savvy because Flickr is so easy to use. Microsoft's adCenter Labs are fantastic. 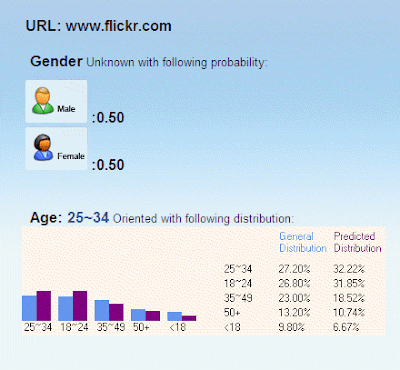 It just took me three seconds to dig up some supporting evidence about Flickr's demographics. How many web sites have that natural alert space built in? My bank has had to adapt their log in page so that it contains a reminder about security. Even then the message is below the log in box and I've no reason to look below the log in box. Flickr's security alert is right where I look. Yahoo's Security Seal is an absolutely cracking idea too. At a glance you can tell if there's something fishy with the log in page. It's such a simple but effective device.